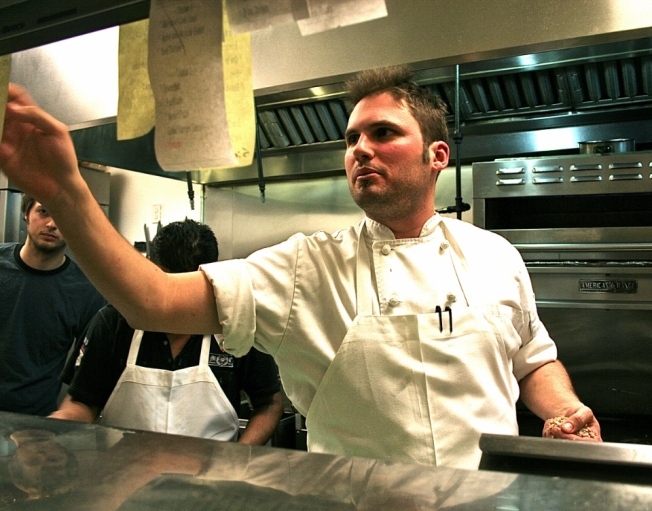 Chef Brad Walker of Boundary Road scans incoming orders. Several D.C. neighborhoods have seen culinary revolutions over the past few years, but perhaps none moreso than the H Street NE corridor, with spots such as Boundary Road leading the pack. With the weather cooling down and chefs turning to winter ingredients, we launch our first of three discussions with H Street restaurant owners and chefs who are leading the H Street restaurant boom. Q: Why did you choose H Street? Brad Walker: This neighborhood is incredibly awesome. People here are really supportive. The restaurant owners, the residents -- everyone was stopping by here, seeing what we were doing, and they were very supportive from the very beginning. Everyone is working in the same direction, and on top of that, the clientele in this neighborhood is sophisticated and into what were are looking to do: creating simple food, prepared properly, using small farmers. ...[T]he rent... is important to me because we want to keep prices down, so people can eat here during the week or even multiple times per week, and the proximity to Capitol Hill is great. Q: One of the great parts of this restaurant is the continually updated menu. Now that it's getting colder and growing season is coming to a close, what should we expect from your menu, ingredient-wise? One of the reasons cooking in the Mid Atlantic is so fantastic is because we have almost a 10-month growing season. One of the local farmers we work with, Northen Neck in Virginia, they grow kale straight through December, till it frosts over. We also work with a Mennonite farming co-op out of Chambersburg called Earth & Eats. When you meet them it's very cool, they have their long traditional beards but the guy I work with, Josiah, wears a Bluetooth behind his ear, which is pretty interesting. But they have a lot of greenhouse produce like salad greens and tomatoes that helps get us through the winter months. So in the coming months you will start seeing a lot of hearty greens, a lot more squash, root vegetables. I get e-mails from local farmers twice a week. and that is how I structure the menu and we try to stay true to what is locally available. Q: What's hot right now at Boundary Road? Tomato-braised tripe with hand cut tagliatelle. That's one of the reasons I love this neighborhood -- people are eating tripe! It's earthy, it's rich, and it's selling really well. 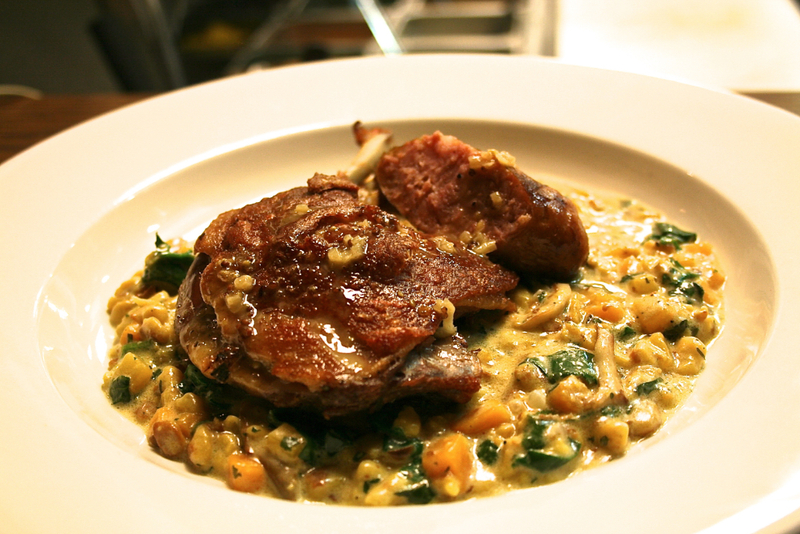 Hunter's Plate [pictured left]: duck leg confit (duck leg is rubbed with green salt, then cured for 24 hours, then submerged in duck fat and cooked slowly for six hours), set over house-made spiced pork Jagerwurst on Sunshine kabocha spaetzle with butternut squash, shallots, spinach and a mustard white-wine sauce. 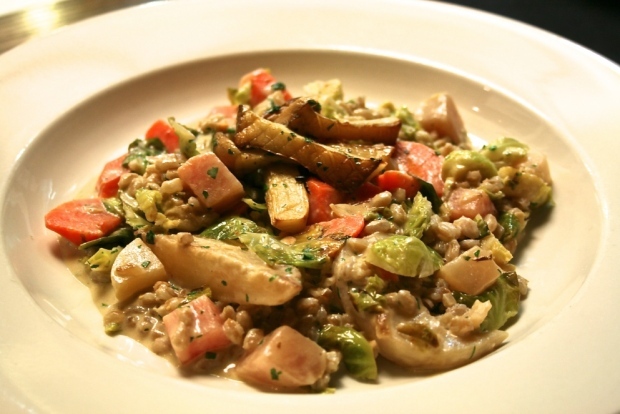 Fall Farro Risotto: a variety of harvest vegetable cooked in different techniques such as glazed turnips, roasted rutabaga and grilled radicchio in a vegetable broth finished with goat cheese and Royal Trumpet mushrooms. The Leaf Peeper: Applejack, Domaine de Canton, apple cider, lemon, red wine. Q: Other than your own, of course, what's the restaurant people should check out in D.C.? BW: Cashion's Eat Place [1819 Coumbia Road NW]. They have been doing this type of menu for a long time. No microwave, no TV, working with local farmers. I took a lot of inspiration for our menu and our style. When President Obama ate here, we had only been open three weeks and I called [Cashion's co-owner] John [Manolatos] -- who was my old boss -- and I told him I needed help, and he was there for me. They've been doing great things since the early '90s.